The Metro Denver economy and commercial real estate markets are showing signs of recovery, prompting quite a spate of activity in small-cap property trading in recent months. Lenders are offering lots of vacant and low-occupancy REO properties for sale - and in some cases are even offering to finance purchases. Investors and users alike have begun jumping in, typically nabbing bargains even below heavily discounted listed prices. So it's a pretty good time for well-heeled opportunistic types to snap up smallish commercial buildings and lure tenants with aggressive rental rates, says veteran area broker Marc Lippitt, co-principal at Unique Properties LLC. One well-located office property Lippitt and his partner Scott Shwayder handled for a lender sold to a local investor for only about 40 percent of the $5 million it fetched just three years ago. And beyond the swelled roster of REOs on the market, Metro Denver is also now seeing far more "brisk" non-distressed property trading, stresses Lippitt, whose 50-staff firm (an affiliate of the TCN Worldwide network) is extremely active in small-cap investment sales and leasing. "It's good to be busy again" after a 2009 many locals would just as soon forget, he adds. In addition to more REO offerings and a more liquid financing environment, a recovering economy and property markets are also tending to boost small-cap investment activity here. The area's unemployment rate appears to have peaked, recently falling back below 8 percent after several flat months, Metro Denver Economic Development Corp. reports. And local office market fundamentals this year have started rebounding in landlords' favor, according to homegrown brokerage Frederick Ross Co. With gross leasing activity clearly picking up, vacancies inching downward and effective rents stabilizing, the century-old firm is projecting positive net absorption for full-year 2010. Of course landlords still have to lure tenants with attractive rental packages, a factor that continues to put pressure on effective rates even in the most resilient markets including Denver's revitalized CBD and the area's tech-oriented Southeast suburbs. Overall office vacancies still stand at nearly 20 percent - ranging from less than 12 in Midtown to more than 30 in Aurora. As for Metro Denver's industrial sector, Frederick Ross is also anticipating positive absorption for the year, along with declining vacancies, and soft but stable rents. The overall industrial vacancy rate is back below 8 percent, but the R&D/flex sector's rate remains above 14 percent - meaning landlords looking to fill smaller spaces in several submarkets continue facing downward pressure on effective rental rates. 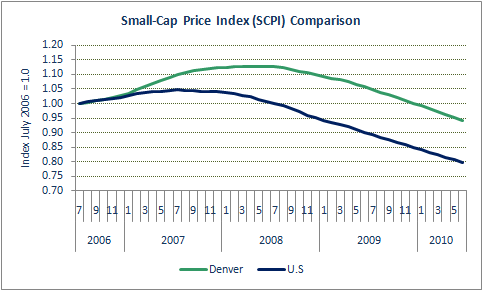 According to research from Boxwood Means Inc., small-cap properties in Denver appreciated more robustly than the nation as a whole in 2007, and hit a peak in mid-2008 - roughly a year after the national apex. Since then values have declined at a relatively modest pace: 16.4 percent since the local peak compared to the 23.7 percent national average. Of course the Front Range of the Rockies is known for its quality of life, and Denver is known for being relatively business-friendly. Its resilient and reasonably diversified economy is anchored by oil, gas and other energy sectors (including new-wave alternatives), as well as defense and related technologies. Accordingly in addition to real estate investors jumping on available bargains, small-cap buyers in many cases of late have been users - including some reflecting Colorado's penchant for start-ups. "We're now seeing a lot of users in the market" as tenants as well as prospective property owners, says Lippitt. "They're cautiously hiring new people, and are more likely to consider three-year leases" whereas 12 months seems to have been the limit during the darkest days, he continues. For instance on behalf of Westerra Credit Union, Lippitt and Shwayder recently sold the 15,600-square-foot office/warehouse property in Centennial known as 7 Inverness to a user for a reported $1.35 million (it had been listed at $1.7 million). Its last tenant had had paid rent in the "high teens" per foot on a NNN basis, but when this user vacated the previous owner couldn't find a replacement even at $10 per foot on a gross basis, Lippitt relates. While that property's new owner-user had access to outside financing, Lippitt notes that foreclosing banks in select situations have become willing to finance REO sales to credit-worthy buyers. Of course these deals are often underwritten at "drastically written-down" valuations. Lippitt expects the Unique Properties team to remain quite busy helping lenders shed distressed assets well into next year. "There are lots more commercial REOs coming down the road here."